Santa has an outpost at our little cabin at the Cultural Center. 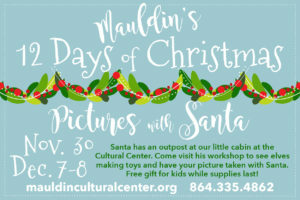 Come visit his workshop to see elves making toys and have your picture taken with Santa. Free gift for kids, while supplies last! The Snow Castle will be on-site selling their famous hot cocoa and coffee!